At Bard Early College Hudson, students take a college course load in the liberal arts and sciences. All classes are taught by college faculty who are active and accomplished in their fields. Classes are inquiry- and discussion-based, encouraging active engagement with professors and peers. All students in the program take an interdisciplinary seminar sequence, one class a semester. Through critical reading and interpretation, students engage with seminal texts from antiquity to modernity across the humanities. The mission of Bard Early College is to provide bright, highly motivated students of high school age the challenge of a rigorous course of study that emphasizes thinking through writing, discussion, and inquiry, enabling them to begin college upon completing the 10th grade. That an early college based on these principles could provide a model for reforming the education of American high school students. 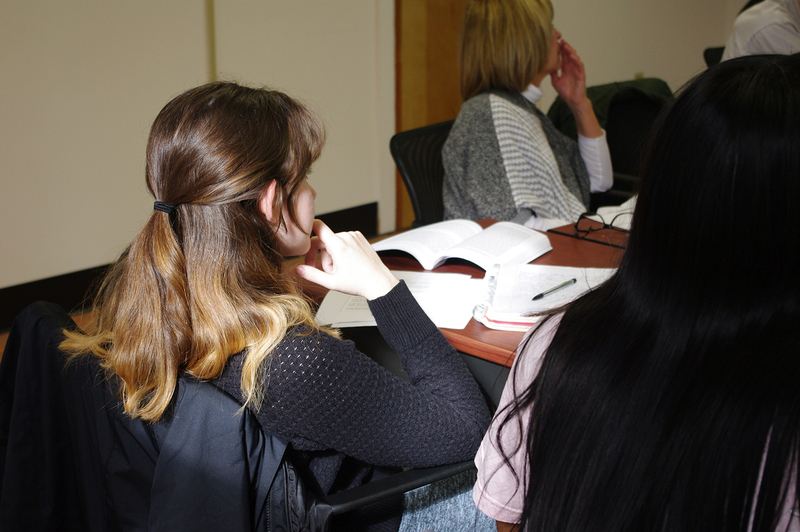 Every fall semester begins with The Writing & Thinking Workshop, an intensive learning experience that provides students with interesting exercises in critical reading and writing upon which they can build in their regular courses. Conceived by Bard College president Leon Botstein and based on the principle that strong writing and close reading enrich and enliven the classroom experience in all disciplines, the workshop sets the stage for the kind of interdisciplinary, intensive work students will tackle during their time at Bard. Faculty members lead students in short writing activities, critical reading exercises, and group discussions about the texts at hand—a shared selection of traditional and contemporary poetry, plays, essays, fiction and non-fiction from several disciplines—developing a common vocabulary that will serve students well as they continue to grow as readers, writers, and thinkers. Whether engaged in a ten-minute “focused free-write,” or debating the meaning of a line of poetry, students not only work with faculty and with each other to build their critical language skills, they also experience what it means to participate in an intimate intellectual community. They learn to take initiative, speak up, and think differently while listening to alternative ideas, presenting personal work for feedback, and providing thoughtful criticism on others’ work. By the end of the workshop, students produce a piece of polished prose that can become a tool for reflection, skill assessment, and continued development.